FlowerPowerWithJill.com debuted, appropriately enough, on Valentine’s Day. 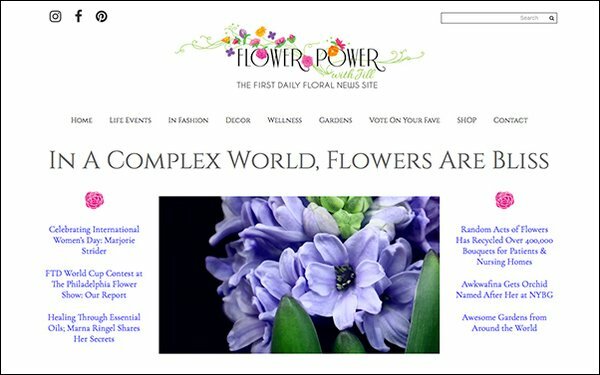 In a crowded digital world, it claims its own fragrant twist: The first daily floral news site to celebrate flowers in all facets of life. From fashion to décor, science to the arts, Flower Power With Jill takes a comprehensive look at a specific subject, promoting its beauty and versatility. “Flowers are a great source of pleasure,” says editor in chief Jill Brooke, a former CNN correspondent. Brooke has written for The New York Times, Metropolitan Home and Architectural Digest. She was also EIC of luxury pub Avenue. Given her background in entertainment and design, the site was a natural fit. Flower Power With Jill is positioned as a one-stop marketplace. As an Amazon Affiliate, users can buy anything with a floral element: clothes, perfumes, housewares, wedding or birthday gifts — the site takes a percentage of sales. Plus, she’s in discussions about future sponsorships. Brooke is tending to a booming business. Smart Asset says the flower industry scoops up $34 billion in yearly revenue. In 2015, a National Gardening Survey reported consumers spent $36.1 billion dollars on lawn and garden spending, a boon for retailers. Gardens are not only stress reducers; they are a form of satisfaction. Gardening is one of the most-popular hobbies in the U.S. As of 2018, per Statista, nearly 11% of 18-29-year olds gardened; 5 million of the 6 million “new” gardening households were millennials. Some 20.6% of 30-49s, and almost 30% of 50-64s also garden. The site speaks to all demographics. She credits art director Tere Parsons, a seasoned brand and product designer, and Linda Lee, who edited The New York Times’ House & Home gardening section, one of the site’s writers, in helping to shape the vision.